W. H. G. Kingston : Great African Travellers, 1874. W.H.G. Kingston: Great African Travellers, From Mungo Park To Livingstone And Stanley. George Routledge and Sons, London, 1874. These references were identified by Hervé Manificat in December 2015. 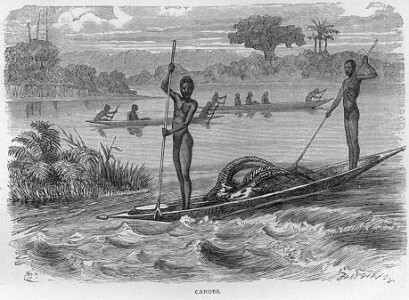 Most of the water craft detailed in the various accounts are dug-out canoes, but also note the rafts of ambatch-wood of the White Nile and the gourd rafts used on Lake Chad. 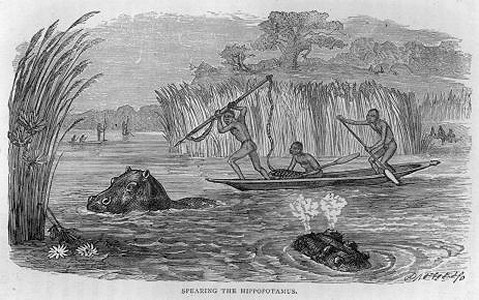 Importantly, the book gives several accounts of hunting hippopotamus with a barbed-spear (harpoon) and attached float, the same method used by generations of off-shore whalers. The earliest evidence of human interaction with hippos comes from butchery cut marks on hippo bones at Bouri Formation dated around 160,000 years ago. Chapter Nine: Journey of the Landers, and their voyage down the Niger, 1830. 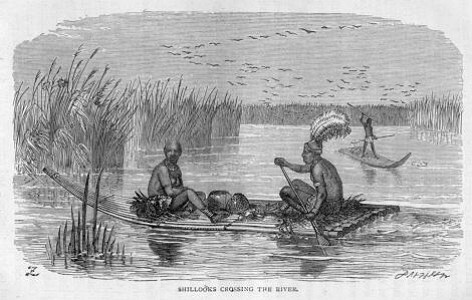 This definitely a coastal scene, however, all the canoe references in the text appear to be inland on lakes or rivers, with a brief account of landing at Quillimane in Chapter 20, below. Hervé Manificat notes that the image seems to show mosquito-canoes of Batanga. 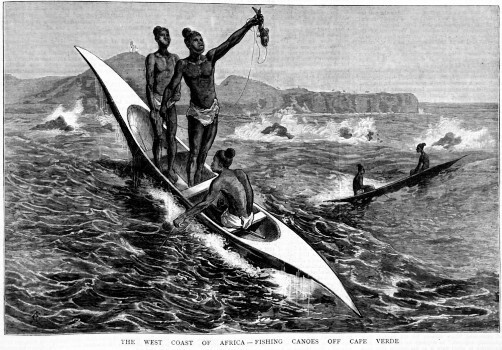 Mary K. Kingsley: Canoes and Fishing, West Africa, 1899. Chapter Eleven: Travels of Dr Barth, continued. The inhabitants on the shores of the lake subsist chiefly on fish, which they catch in an ingenious way. The fisherman takes two large gourds, which he connects by a bamboo of sufficient length to allow him to sit astraddle between them. He then launches forth on the water, taking his nets. These are weighted by little leathern bags, filled with sand and supported by bits of bamboo. When they are full, he returns to the shore. Chapter Eighteen: Travels of Dr Livingstone—first expedition. Leaving the wagons in charge of the natives, with the exception of a small one which proceeded along the bank, Dr Livingstone embarked in one of their canoes. Frail as are the canoes of the natives, they make long trips in them, and manage them with great skill, often standing up and paddling with long light poles. They thus daringly attack the hippopotami in their haunts, or pursue the swift antelope which ventures to swim across the river. The natives inhabiting the banks of the rivers falling into Lake Ngami are famed for their skill in hunting the hippopotamus. In perfect silence they approach in their light canoes, and plunge their sharp spears, with thongs attached, into the back of one of the huge creatures, which dashes down the stream, towing the canoe at a rapid rate. 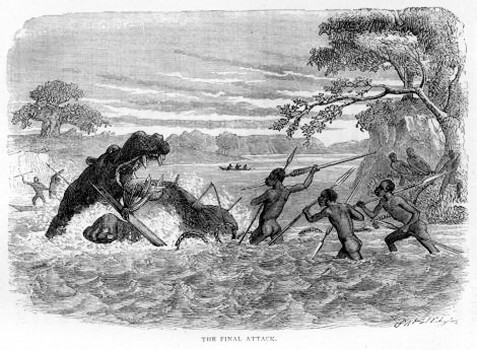 Thus [three illustrations] the animal continues its course, the hunters holding on to the rope, till its strength is exhausted, when, other canoes coming up, it is speared to death. Frequently, however, the hippopotamus turns on its assailants, bites the canoe in two, and seizes one of them in its powerful jaws. When they can manage to do so, they tow it into shallow water, and, carrying the line on shore, secure it to a tree, while they attack the infuriated animal with their spears, till, sinking exhausted with its efforts, it becomes their prey. Chapter Twenty: Travels of Dr Livingstone, continued. The party now directed their course to the Zambesi near its confluence with the Kafue. Pursuing their course down the left bank, they came opposite the island of Menyemakaba, which is about two miles long and a quarter broad. Besides its human population it supports a herd of upwards of sixty buffalo. The comparatively small space to which the animals have confined themselves shows the luxuriance of the vegetation. The only time that the natives can attack them is when the river is full and part is flooded: they then assail them from their canoes. After waiting about six weeks at Quillimane, HM brig “Frolic” arrived, on board which he embarked. A fearful sea broke over the bar, and the brig was rolling so much that there was great difficulty in reaching her deck. The doctor tried to encourage him; but, though well acquainted with canoes, he had never seen anything like it. Chapter Twenty Two: Dr Livingstone’s expedition to explore the Zambesi, continued. It [Lake Nyassa] is visited by sudden and tremendous storms. One morning the sea suddenly rose around them, preventing them from advancing or receding, as the tremendous surf on the beach would have knocked their light boat to pieces, while the waves came rolling on in threes, their crests broken into spray. Had one of them struck the boat, nothing could have saved her from being swamped. For six hours they remained at anchor a little from the shore, thus exposed to the fury of the gale. Chapter Twenty Three: Travels of Sir Samuel and Lady Baker. 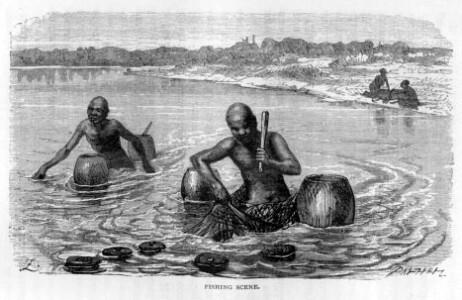 After spending three months at Son, he set out for the Settite River, he and his wife crossing the Atbara River on a raft formed of his large circular sponging bath supported by eight inflated skins secured to his bedstead. A party of the Aggageers now joined him. Among them was Abou Do, a celebrated old hippopotamus hunter, who, with his spear of trident shape in hand, might have served as a representative of Neptune. The old Arab was equally great at elephant hunting, and had on the previous day exhibited his skill, having assisted to kill several elephants. He now divested himself of all his clothing, and set out, taking his harpoon in hand, in search of hippopotami. This weapon consisted of a steel blade about eleven inches long and three-quarters of an inch in width, with a single barb. To it was attached a strong rope twenty feet long, with a float as large as a child’s head at the extremity. Into the harpoon was fixed a piece of bamboo ten feet long, around which the the rope was twisted, while the buoy was carried on the hunter’s left hand. After proceeding a couple of miles, a herd of hippopotami were seen in a pool below a rapid surrounded by rocks. He, however, remarking that they were too wide-awake to be attacked, continued his course down the stream till a smaller pool was reached. Here the immense head of a hippopotamus was seen, close to a perpendicular rock that formed a wall to the river. The old hunter, motioning the travellers to remain quiet, immediately plunged into the stream and crossed to the opposite bank, whence, keeping himself under shelter, he made his way directly towards the spot beneath which the hippopotamus was lying. “Stealthily he approached, his long thin arm raised, with the harpoon ready to strike. The hippopotamus, however, had vanished, but far from exhibiting surprise, the veteran hunter remaining standing on the sharp ledge, unchanged in attitude. “Three minutes thus passed, when suddenly the right arm of the statue descended like lightening, and the harpoon shot perpendicularly into the pool with the speed of an arrow. In an instant an enormous pair of open jaws appeared, followed by the ungainly head and form of a furious hippopotamus, who, springing half out of the water, lashed the river into foam as he charged straight up the violent rapids. With extraordinary power he breasted the descending stream, gaining a footing in the rapids where they were about five feet deep, thus making his way, till, landing from the river, he started at full gallop along the shingly bed, and disappeared in the thorny jungle. The old man rejoined his companions, when Mr Baker proposed going in search of the animal. The hunter, however, explained that the hippopotamus would certainly return after a short time to the water. In a few minutes the animal emerged from the jungle and descended at full trot into the pool where the other hippopotami had been seen, about half a mile off. Upon reaching it, the party were immediately greeted by the hippopotamus, who snorted and roared and quickly dived, and the float was seen running along the surface, showing his course as the cork of a trimmer does that of a pike when hooked. Several times the hippo appeared, but invariably faced them, and, as Mr Baker could not obtain a favourable shot, he sent the old hunter across the stream to attract the animal’s attention. The hippo, turning towards the hunter, afforded Mr Baker a good chance, and he fired a steady shot behind the ear. The crack of the ball, in the absence of any splash from the bullet, showed him that the hippopotamus was hit, while the float remained stationary upon the surface, marking the spot where the grand old bull lay dead beneath. 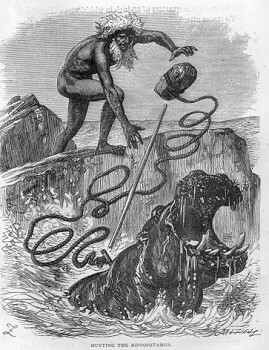 The hunter obtaining assistance from the camp, the hippopotamus, as well as another which had been shot, were hauled on shore. The old bull measured fourteen feet two inches, and the head was three feet one inch from the front of the ear to the edge of the lip, in a straight line. Though hippopotami are generally harmless, solitary old bulls are sometimes extremely vicious, and frequently attack canoes without provocation. Chapter Twenty Four: Travels of Sir Samuel and Lady Baker, continued. On the 2nd of January they were sailing past the country inhabited by the Shillooks, the largest and most powerful black tribe on the banks of the White Nile. They are very wealthy, and possess immense herds of cattle; are also agriculturists, fishermen, and warriors. Their huts are regularly built, looking at a distance like rows of button mushrooms. They embark boldly on the river in their raft-like canoes, formed of the excessively light ambatch-wood. The tree is of no great thickness, and tapers gradually to a point. It is [illustration] thus easily cut down, and, several trunks being lashed together, a canoe is quickly formed. A war party on several occasions, embarking in a fleet of these rafts, have descended the river, and made raids on other tribes, carrying off women and children as captives, and large herds of cattle. All persons who have voyaged down the West Coast of Africa will know that Cape Verde is one of the few prominent places which are sighted by the steamers. Land is always a welcome spectacle to travellers on a long voyage, and at this point the interest is often increased by the appearance of natives in fragile-looking canoes, tossed up and down like feathers on the huge swell, which invariably prevails on that part of the coast. It seems wonderful that men should be able to fish from such frail vessels, yet they have been seen to stand up in them, holding up their fish for sale to passing ships, without apparently any difficulty of preserving their balance. 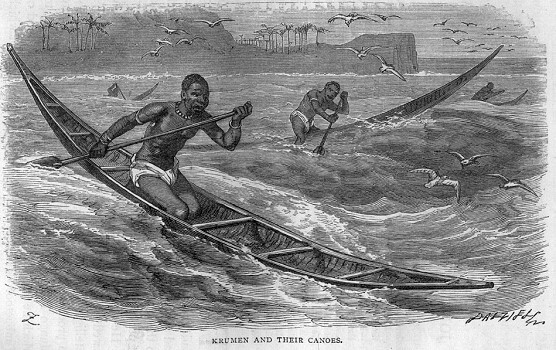 Fishing Canoes off Cape Verde, 1880. The Graphic: An Illustrated Weekly Newspaper London, vol. 22 December 25, 1880, page 653. Comments: Line fishing from canoes. Also shows loin cloths and hairstyles of fishermen, and gives some idea of the heavy surf. 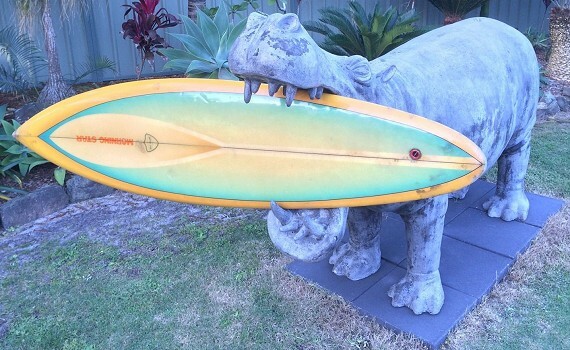 Hippopotamus and Morning Star Surfboard, 2014? Geoff Cater (2016) : W.H.G. Kingston: Great African Travellers, 1874. Speaking of waves in the heart of Egypt, several hundred kilometers from any sea? Yet, the Nile, the world's largest river, which, from antiquity to the 20th century, has mobilized hundreds of geographers and explorers wanting to map its course and find its source was a rushing river lined with formidable cataracts . The Aswan population was accustomed to brave the first one on improvised floats to the great entertainment of travelers since ancient times, as the Greek geographer Strabo, who visited Egypt in 25 BC. A little over Éléphantine1, is the small cataract, where we see people riding on skiffs give a sort of show to major country. Cataract is a hill of rock in the middle of the Nile, united at the top and covered by the waters of the river; it ends with a precipice, from which water rushes impetuously from either side, toward the coast, there is a navigable bed; drivers are lured towards the cataract, then rush skiff with them, without them no harm happens. 1 located on the Ile river up to Aswan. vicissitudes and safe; often because of a shoulder strike the great pachyderm capsized the canoe frail and crocodiles are ready for revenge.